ScreenHunter is a powerful screen capture software to capture, print, and edit any part of desktop screen, you can save the result as photo and video files. The program allows you to capture any part of your desktop whether it is a window, full screen, and more. ScreenHunter provides you an extra ordinary environment to boost up the productivity through its versatility, flexibility, and organization. You can print and edit screenshots with annotations, and save the results in MP4, FLV, JPEG, BMP, PDF, and GIF files. ScreenHunter Pro is an all-in-one image capture and video recording software that provides you the total capture solution to save you time and boost productivity. 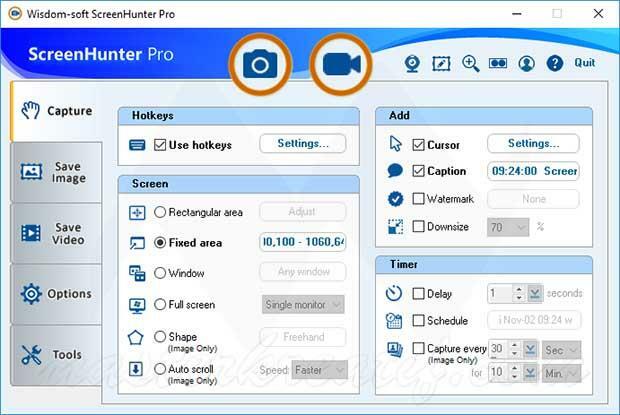 ScreenHunter Pro Full Version supports auto-capture, personalize your photos, add custom effects, webcam and video screen capture, supports up-to 8K display @100 fps, and also capable of automatic file naming for screenshots.